He hasn’t even seen the book. It’s not one that you let three-year-old hands touch. There’s a photo of a ledge on El Capitan, in the coffee table tome from Patagonia books, Yosemite in the Fifties: “If this ledge could talk—of the thousands who’ve clawed onto it, who’ve slept on it, cried on it, shat on it, quit climbing forever and ever on it,” reads the caption. 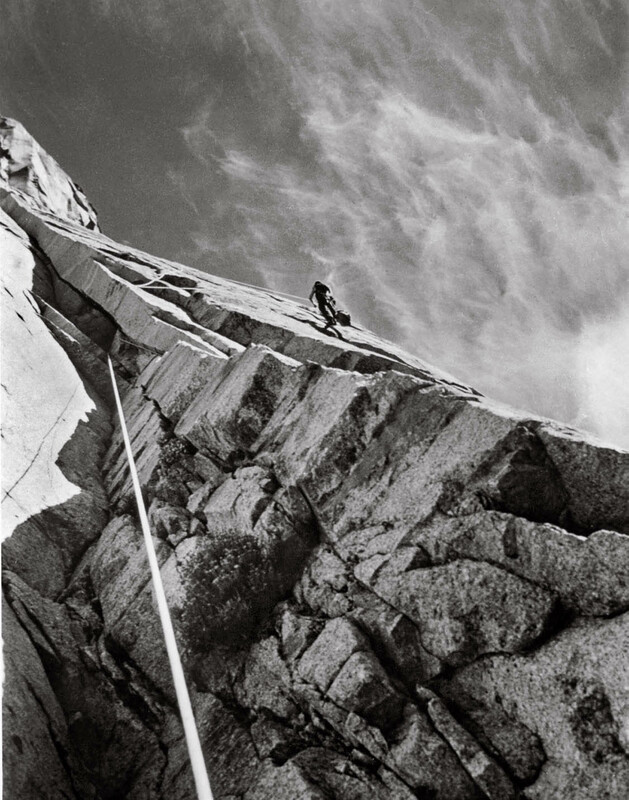 The photo was taken by Wayne Merry in 1958, on the epic two-day first ascent of The Nose. It had taken his partner, Warren “Batso” Harding, 47 days over 18 months with various partners to put the route together, fixing lines between camps and siege-grovelling their way up. At 6:00 a.m. on November 12, 1958, they made history. 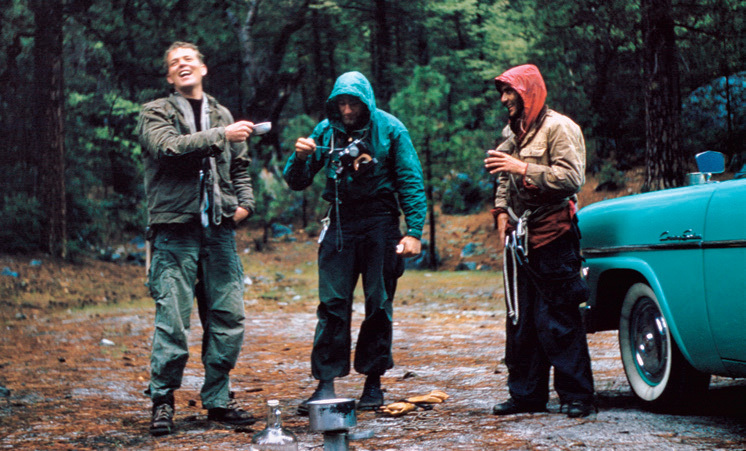 Two years later, Royal Robbins, Chuck Pratt, Joe Fitschen and Tom Frost would complete The Nose’s second ascent, without fixed ropes, in just six and a half days, ushering in a new era of climbing. And from there, the records would start to fall: by 1975, John Long, Jim Bridwell and Billy Westbay would climb it in a day; Lynn Hill free-climbed it in 1994 in 23 hours; Tommy Caldwell got that down under 12 in 2005; Dean Potter to just under two-and-a-half in 2010, and Alex Honnold has since shaved a few minutes off to come in at 2 hours and 23 minutes. Honnold subsequently free soloed the route as part of an epic 18-hour, 50-minute link-up of three Yosemite classics. 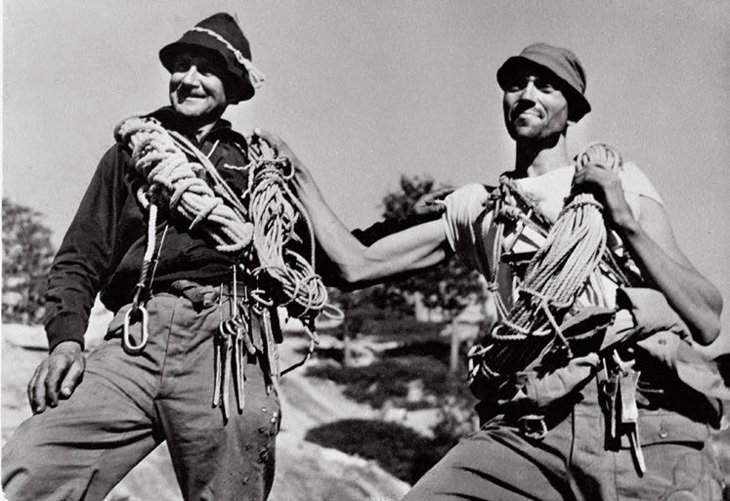 None of the gear, equipment, techniques or even methods for capturing and recording a climb are the same these 60-some years later, but the sentiment reflected in the caption for that half-blurred 1958 image remains timeless—as anyone who has clawed onto a ledge and quit climbing right then and there, forever and ever, can attest. A book is a wormhole. Co-authored by John Long, Dean Fidelman and Tom Adler, Yosemite in the Fifties is a direct route to the most storied place in Rockdom during a seminal age when the first big walls were pioneered by men who forged their own protective gear on backyard anvils—pitons and stove legs and hardware that left scars in the rock which would later seem sacrilegious but still make for the most incredible finger jams when you’re miles off the valley floor (see sidebar: Finding Iron). 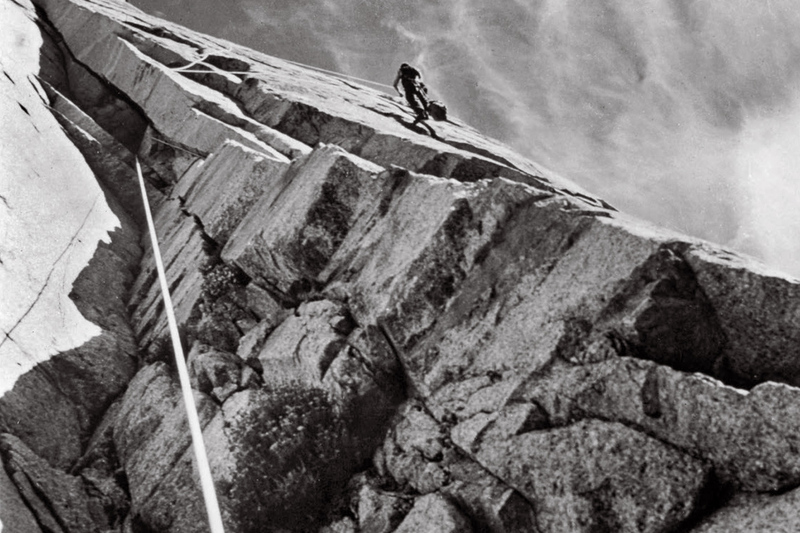 1950s Yosemite has been dubbed the Iron Age—semaphore for the iron will, steel cojones, and handforged chromium-molybdenum alloy gear applied to the task of scaling the most improbable, commanding, aesthetic granite walls in the world. “Flint hard and flawless” was the rock. It took a certain type of person to tackle challenges that large-looming. Yosemite in the Fifties is their story. The book features restored photos and original source material that took years to excavate, track down, compile. And it almost didn’t get made. 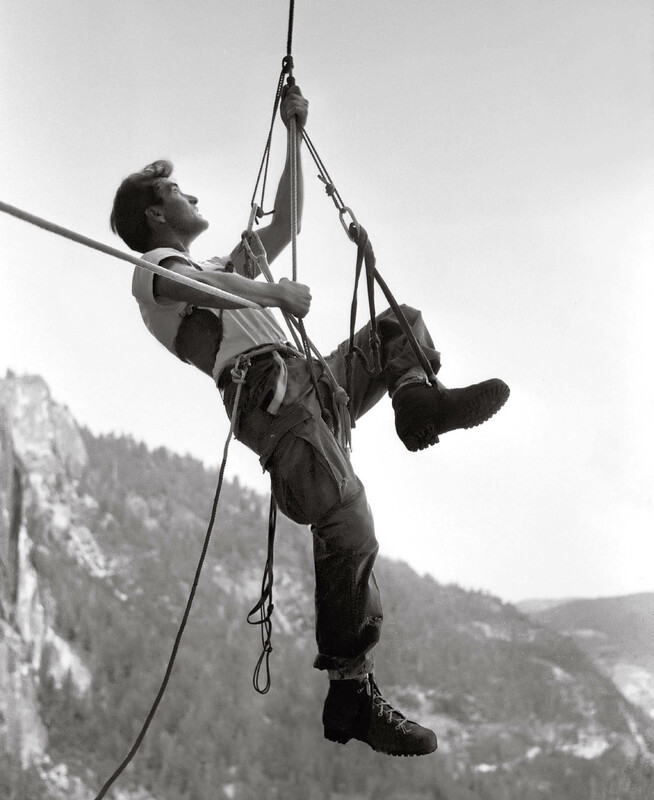 Photographer Dean “Bullwinkle” Fidelman and writer John “Largo” Long have been documenting rock climbing since the 1970s. Designer Tom Adler has been the spare hand behind other companion classics, including Glen Denny’s definitive Yosemite in the Sixties, and Long and Fidelman’s The Stonemasters: California Rock Climbers in the Seventies. The trio reconvened to build a bridge back to a lost era of classic Americana. While the legends of 1950s Yosemite are mostly dead or wrecked now, survivors of sound mind, now in their eighties, sit like old dragons on hoards of obscure treasure—old slides and photographs and relics. Fidelman knew those photos were out there, mouldering away. Even some of the 1970s material he’d sourced for Stonemasters was already curling up, disintegrating, on the verge of vanishing. While the legends of 1950s Yosemite are mostly dead or wrecked now, survivors of sound mind, now in their eighties, sit like old dragons on hoards of obscure treasure—old slides and photographs and relics. Though he’s been writing about climbing for 40 years—and winning awards for it—he says he couldn’t have done such a book before. “No way could I have done it when I was young. I didn’t have the sensibility. Even the captions—I had to have a lot under my belt to write like that. You have to tap a universal part of your own brainpan to even get on that frequency,” he says. “I’m not from the fifties. I was born in the sixties. I had no business doing anything but being a shepherd here and that’s what I tried to do. It’s totally a legacy work, not some blog, someone’s rantings. I read blogs all the time. They’re fun, but they’re disposable. Fidelman concurs that creating a repository and future for this history was key to the book’s genesis. Long and Fidelman started with plans to self-publish under their own Stonemaster Press, the house that put out two of their previous titles. But a disagreement with the other business partner, over financing his research up-front, prompted Fidelman to dissolve the company and pitch the idea to loose contacts he had in Patagonia’s photography department. They turned him down. 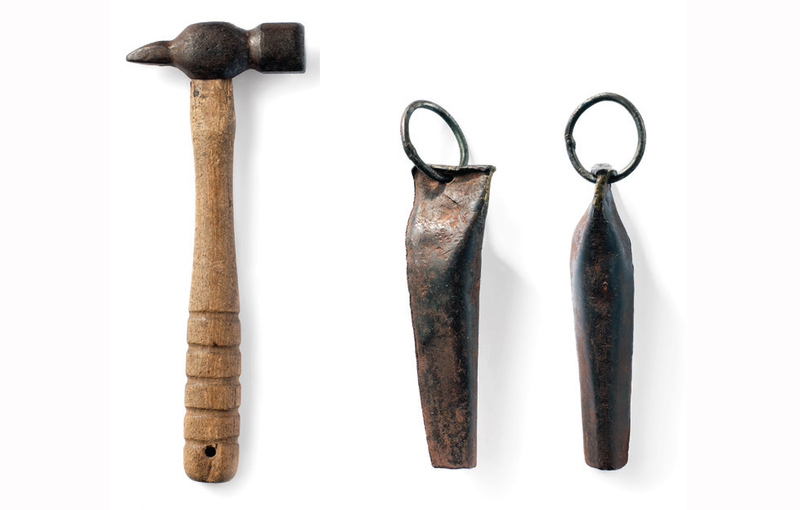 Fidelman’s tenacity honours the men whose stories he was holding in his hands, who had to introduce themselves to themselves with every hammer blow and busted drill bit and stinking can of kipper snacks choked back on those airy walks up the wall. More than that, it’s a signal, a way of communicating to any outdoor adventurer who wanders into your living room, or sleeps on your couch: this is your lineage too. You are part of this tradition of crapping your pants for fun. The book is the kind of accessory that every climber who has graduated from living in their van will want on the coffee table. The tribe’s founding stories, writ in black and white photos, spare text, masterful captions, archival accounts. More than that, it’s a signal, a way of communicating to any outdoor adventurer who wanders into your living room, or sleeps on your couch: this is your lineage too. You are part of this tradition of crapping your pants for fun. And though nothing you ever do will be as bold as what these guys did, you’ll stand on their shoulders any day of the week.